There are days your therapy materials are color-printed and laminated. You were on your game and prepped them last week. Then there are days when you need to grab the stack of sticky notes and work on the fly. 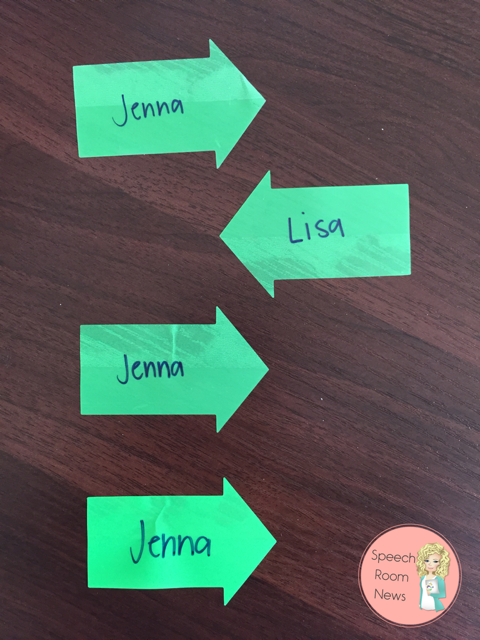 I have a serious love of post-it notes and thought I’d pop in and show some ways to use them for various speech therapy activities. 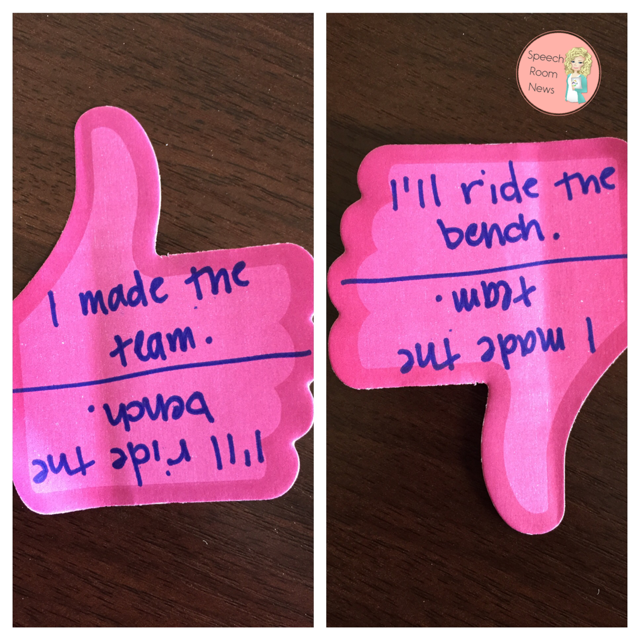 In the past, I’ve shared my favorite sticky note activity Think Vs. Say. 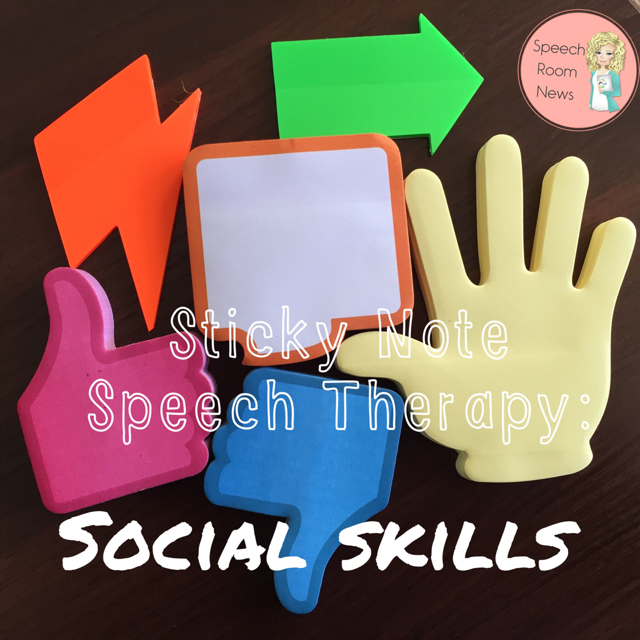 Today, I’m sharing 6 new ways to use sticky notes in social skills therapy. 1. Conversation Starter. Write a topic on a sticky note. Place it in the center of the table. Each time a student adds to the conversation, place a dot on the edge of the square facing them. When the conversation is complete, you can identify how many times each student participated. 2. Weird Thought Alert! Social Thinking® programs that I’ve used teach students about how their behavior has an impact on others. Are you giving people good thoughts or uncomfortable (weird) thoughts? You can read more about teaching weird/uncomfortable thoughts here on SocialThinking.com. 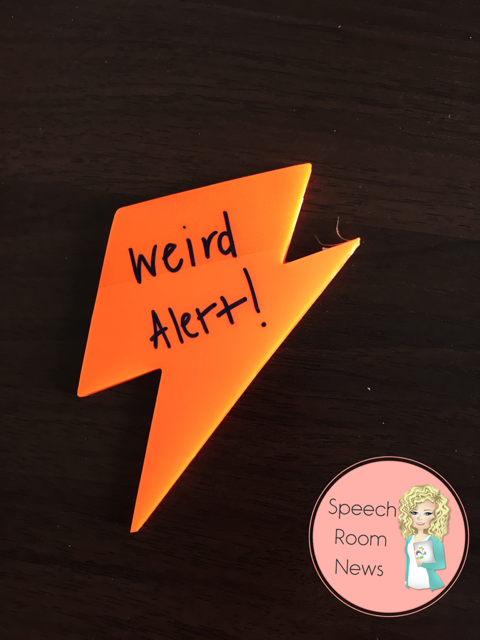 Use these lightening bolt sticky notes to identify something that gives the group a weird thought. Using the non-verbal prompt you can give your student the chance to make changes or get back on topic by himself. 3. Turn Taking. Arrow sticky notes are great for identifying turn taking in a conversation. Each time a student speaks, give them an arrow. When the conversation is over, quickly analyze what happened. Did someone dominate? How does the pattern change for different topics? 4. Reframe the negatives. One thing students can struggle with socially is focusing on the negative all the time. Other children (and adults) can tire of this in conversations. 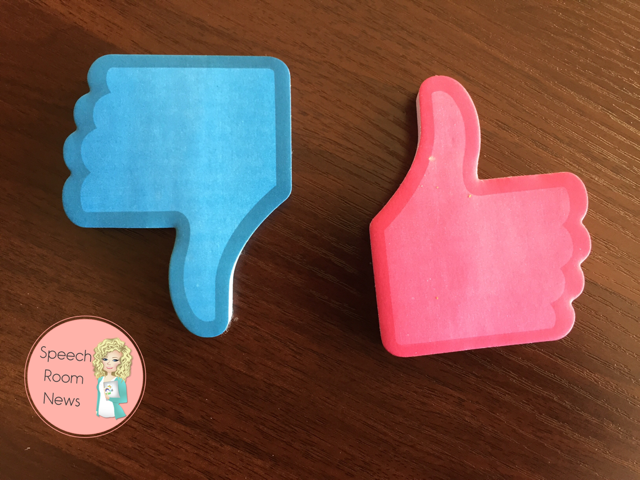 I like to use these thumbs up sticky notes. Draw a line across the hand. When the thumb is facing down, write the negative comment said by the student. Turn the thumb into the ‘thumbs up’ position and re-write the statement as a positive. 5. Topic Maintenance. Grab a hand-shaped sticky note and use it to help students stay on topic. 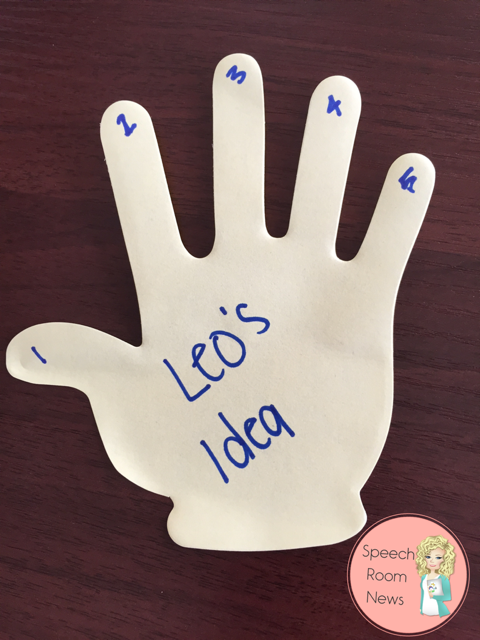 If your student has a hard time talking about another person’s idea, write “(other student’s name)’s Idea” across the palm. Challenge your student to maintain on his/her conversational partner’s idea of 5 turns in conversation. 6. Specific Interest. Have you been stuck at a holiday party with an adult who needs help limiting their discussion about their special interest yet? Many of our students (and adults at holiday parties) need help identifying when their conversational partner is no longer interested in their preferred topic. 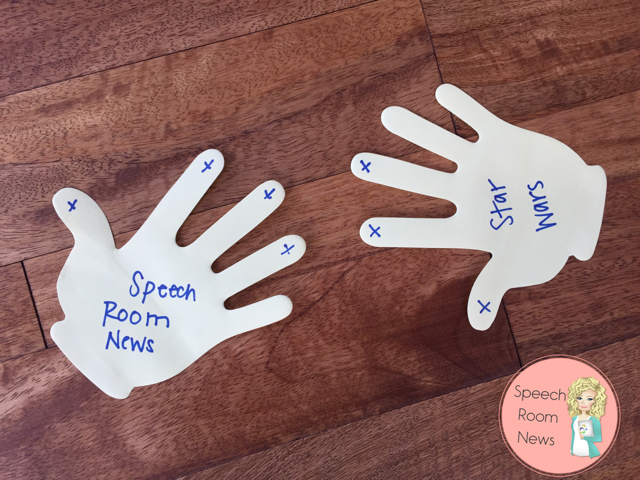 I might want to spend all morning talking about my blog, Speech Room News. My cousin might want to spend all morning talking about the new Star Wars movie. Our interests aren’t interesting to each other! Give each student a hand-shaped sticky note. Let them talk about their preferred area of special interest for only 5 turns in the conversation or to give 5 facts. Now stop and evaluate. What does the body language of the person you’re talking to tell you? Did they ask another question to maintain the topic or do they look ready to talk about something else? If they aren’t returning rapid fire questions about the Death Star maybe it’s time to move on. Each of these sticky notes was found at your local big box store. You can also check out the office supply stores! I’d love to hear how you use them in social skills groups! Leave me a comment below! « No More Mumbling: How to improve mumbling. This is such a great idea!. I’m going to work on this in January. What great ideas! I really liked the fliiping negative comments into positives! Thanks very much…terrific ideas for conversational skills & so easy with a sticky note! Really appreciate all the wonderful ideas from your blog, Jenna! I am a SLP in the school setting (middle school) and the teachers here are starting to ask me to not pull kiddos from their classes. My schedule is crazy. Majority of my kiddos have what we call RSP classes (Special ed resource). What would be the best approach to providing services in the classroom. The teacher has no problem with me going in the class and working with the kiddos, but I do not believe that she would be okay with me teaching or co teaching. What kind of activities do you recommend that would not distract the other kiddos. Any suggestions would be greatly appreciated. This is such a wonderful idea. Where can you buy these sticky notes from?